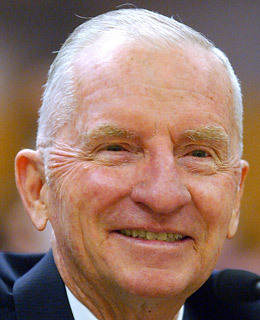 It's been 16 years since Ross Perot's first presidential bid, and any mention of the small Texas businessman still leaves people confused. Who was he? Why was he here? And why did he select Patsy Cline's Crazy, a 1961 ballad about being hopelessly in love, as his campaign song? The song was slow, off topic, and easy to ridicule, but Perot  who announced his candidacy on "Larry King Live" and advertised via paid infomercials  felt it suited him perfectly. He debuted the song by noting to a crowd that his opponents had dismissed him as a crackpot. "While we're on the crazy theme," he said, "I've got a theme song for my campaign." By the end of the 1992 election, when it was clear Perot would not win the Presidency, he ended his bid by hosting a "victory party" and dancing on stage with his wife as Cline's soft, melodic croon led the nation into the era of Clinton.